QUICK SETS: Cleveland State will make its third consecutive appearance in the NCAA tournament when the Vikings play at 11th-ranked Kentucky in a first round match on Saturday (May 15) at 1:00 p.m. It will be the second straight year that the two teams will meet in the first round with the Wildcats earning a 4-0 win last season. Cleveland State is 20-6 overall and captured its third straight Horizon League Championship with a 4-0 win over UIC on April 25. Kentucky, seeded 12th in the NCAA tournament, is 23-8 overall and is making its 12th appearance in the tournament in the last 13 seasons. The match will follow Saturday's other first round match between Georgia Tech and Binghamton with the two winners playing at 1:00 p.m. on Sunday (May 16). The second-round winner advances to Athens, Ga., where the remaining rounds will take place May 21-25 at the Dan Magill Tennis Complex. REVIEWING THE LEAGUE CHAMPIONSHIP: Cleveland State won its third consecutive Horizon League Championship with sweeps over Butler and UIC two weeks ago in Indianapolis, Ind. Following are recaps of both matches. Cleveland State advanced to its third straight league title match with a 4-0 win over Butler in the semifinals. After winning the doubles point, CSU clinched the match with straight set singles wins by Phil Orno (No. 1), Yannick Goossens (No. 2) and Chris Klepatz (No. 5). AROUND THE HORN: The Cleveland State baseball team will head back on the road for crucial Horizon League contests at Wright State and UIC this weekend, facing both teams in doubleheaders. CSU will face the Raiders on Saturday (May 15) with the first game beginning at 1:00 p.m. and will then face the Flames on Sunday (May 16) in a 2:05 p.m. EST doubleheader. Wright State (13-6) enters the week leading the league, but has lost three out of their last four games, falling twice to Milwaukee and once to Cincinnati. UIC (10-7) begins the week in third place in the league standings, and on a three-game losing streak, dropping a three-game series at Georgia Tech over the weekend. REVIEWING LAST WEEK: CSU was in action five times last week, facing Akron and St. Bonaventure in non-league action and Horizon League opponent Youngstown State in a three-game series over the weekend. Below are recaps of all five games. Game 43 - Akron 8, CSU 2 (May 4): Akron posted three multi-run innings on 15 hits and held the Vikings to just five hits on the day to take an 8-2 victory at Lee Jackson Field. Game 44 - St. Bonaventure 14, CSU 9 (May 5): Tom Carter's three-run homer in the sixth inning was not enough to rally the Vikings, as St. Bonaventure posted runs in six innings to take a 14-9 victory. Game 45 - YSU 10, CSU 8 (May 7): After four ties throughout eight innings, YSU's Jeremy Banks blasted a two-run homer in the 11th inning to seal the game for the Penguins in 11 innings. Game 46 - CSU 16, YSU 11 (May 8): The Vikings posted an 11-run third inning to jump out to a 12-4 lead and never relinquished the lead, holding YSU scoreless in the final four innings to take a 16-11 victory. Game 47 - CSU 12, YSU 6 (May 8): Cleveland State used a six-run first inning and a four-run fifth inning to post a 12-6 victory over the Penguins in the series finale, marking back-to-back wins for the second time this season. SECOND BACK-TO-BACK: The pair of wins against Youngstown State on Saturday (May 8) marked the second time this season that the Vikings have posted back-to-back wins, with CSU winning two in a row against Wright State (April 9-10) earlier this season. CSU trailed just once on Saturday with the Penguins getting out to a 3-1 lead after two innings in game one. CLEVELAND -- After setting a school record for wins in a season and winning a conference-record 22 league games en route to claiming the regular season by a record six games, Cleveland State reaped the awards on Wednesday when the Vikings swept all of the major awards when the Horizon League announced the annual all-league softball team. Freshman Tess Sito was selected as both the Horizon League Player of the Year and Newcomer of the Year, senior Amanda Macenko earned her third consecutive Pitcher of the Year honor and head coach Angie Nicholson was tabbed as the Horizon League Coach of the Year for the second time in three seasons. The 2010 NCAA Division III Men's Golf National Tournament will not take place without a Blue Streak present, as senior Blake Furgerson will be representing John Carroll for a second consecutive year competing as an individual. The 36th Annual Division III championship ournament will be hosted by Elizabethtown College and held at the Hershey Links and Hershey Country Club in Hershey Pennsylvania. on May 11-14, 2010. Last season, Furgerson was named a 2009 PING third team All-American following his appearance in the 2009 NCAA Division III Men's Golf National Tournament. Furgerson was one of only 38 Division III players nationwide to be presented with the honor. This season, Furgerson placed in the top ten in eight of the nine team tournaments, finished atop the field three times and was named OAC Golfer of the Week on two occassions. In addition, Furgerson led the OAC in stroke average with a 72.8 mark on the year. Scott Miller had five top-10 finishes this past season. (HERSHEY, PA)--Mount Union junior Scott Miller (Wykoff, NJ/Ramapo) has been named to the PING All-Great Lakes Region Men's Golf Team by the Golf Coaches Association of America. Miller led the Purple Raiders and was second in the Ohio Athletic Conference with a stroke average of 75.0. In the 10 events he entered, he registered five top-10 finishes and three top-five finishes including a tournament victory at the OAC Fall Invitational at Fox Meadows G.C. in Medina. He helped lead Mount Union to its second straight second place finish in the OAC this season. OBERLIN – In the first day of the sectionals here today at the College, Westlake’s Colton Buffington, the defending sectional champion, breezed through to the quarterfinals by not giving up a single point in the singles division. Buffington, who attended former pro Stan Smith’s school in The South before transferring to Westlake last year, picked it up in the second round after getting a first-round bye by blanking Lorain Admiral King’s Ricardo Caldera, 6-0. 6-0. Buffington then took Lakewood’s Chris Richardson, 6-0, 6-0. In the quarters, Buffington will meet Southview’s Mike Cuevas who beat Olmsted Falls’ Luke Alstadt,. North Royalton’s Rob Butcher and Elyria’s Jordan Melendez..
Richardson beat Avon’s Danny Brown and Berea’s Jack Harrington, Caldera Ridgeville’s Mike Minnick, Butcher North Olmsted’s Matt Dailey, and Melendez Midpark’s Ken Postel. In the other bracket, Lakewood’s Alex Mihas and St. Ignatius’ Sean Frebes will meet in the quarters on Friday. Mihas beat Elyria’s Eli Thompson and Brunswick’s Marc Gerhart, who beat Strongsville’s Jim Beaty in the second round. In a mini Holy War, Frebes beat St. Edward’s Tim O’Malley and Westlake’s Max Salvatore, who eliminated Falls’ Kevin Paradis. 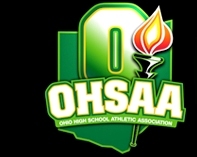 Wildcat James Oliver joined teammate Frebes in the quarters with a duplication of Buffington’s dominance winning 0-0 and 0-0 over Berea’s Cody Anderson and Southview’s Dave Petrefski. Oliver, last year’s runner up, will face Lakewood’s Jimmy Mathieson, a winner over Midpark’s Brian White and Avon’s Marc Schneider. Westlake will joined Lakewood and Iggy with two of its singles players in the quarters as Jason Wissman will face Brunswick’s Ryan Hawley, who upset No.4 seed Rich Karban of Elyria in a three-set third round match. Hawley was down a set before coming back to win the second, 7-6 (8) to force the third set. Wissman beat Royalton’s Eric Payne and Iggy’s Tom Mascia. OBERLIN -- Brothers Sean Kloock and Colin Kloock did not let their mother down by advancing to the semifinals and qualifying for the district tournament in today’s doubles sectionals here at the College. The Kloock's mother, Laura, is the Olmsted Falls coach. The No. 1 seed beat Strongsville’s Will Rousos and Jeff Schempp, Southview’s Marquell Walden and Mike Melendez, Royalton’s Zuban DeVitre and Nick Mussaro. The Kloock boys gave up only five points in the three matches all won in straight sets. North Olmsted’s Andy Heittman and Kurt Russell still need to play Garrett Marsillo and Mike Swartz to determine who will be the opponent in the semis for the Kloock guys. Rain forced the tournament to go inside three times today. In the other doubles draw, Avon Lake’s Nick Trzeciak, whose brother Alex is the No. 1 singles player at Baldwin-Wallace, and Ben Troyer advanced to the semis and the districts with an upset win over Westlake’s Brian Gottfriend and Abhinay Ramachandran, the No. 2 seed, in the quarters. They also beat Amherst’s Tommy Hobson and Alex Flock and Berea’s Kevin Siloy and Eric Knecevich. Strongsville’s Evan Boso and Sid Narayan and St. Ed’s Chas Gustafson and Jeff Williams still need to play in the quarters to determine the opponent of the Shoremen guys. Westlake – The talented underclassmen trio of Grace Amber, Molly Bloom and Alice Zicht was honored by the North Coast Athletic Conference here today. Amber was named to the All-NCAC Second-Team, while Bloom and Zicht were tabbed as honorable-mention selections. Amber, a first-year from Chelsea, Vermont, finished second on the team in goals (33) and draw controls (42). She started all 14 games she played in and also ended the season second on the squad with 20 caused turnovers. Bloom, a fellow rookie who hails from Sharon, Massachusetts, led the Yeowomen in goals (36), assists (12), and points (48). Her fabulous season was highlighted in a 24-18 win against Agnes Scott as she scored a conference record 11 goals. Zicht, the lone sophomore of the bunch to be recognized by the conference office, was second on the team in assists (11) and points (37). Her 26 scores were also the third most for the crimson and gold. 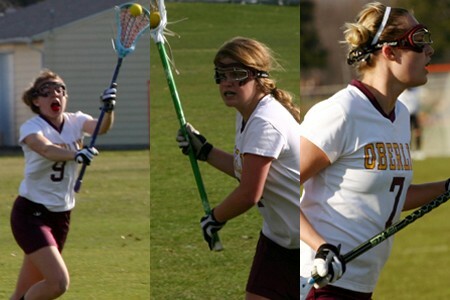 These three players coupled with the other young talent Oberlin has on its roster should lead to a promising 2011 for the Yeowomen. Westlake - Ohio Wesleyan senior attack Jessica Copeland (Ligonier, PA/Foxcroft, VA) and Kenyon senior goalkeeper Chase Kreuter (Riverside, CT/Greenwich Academy) have been named Offensive and Defensive Players of the Year to highlight the 2010 All-North Coast Athletic Conference women's lacrosse selections. announced by he league office here today. Copeland finished the regular season and NCAC tournament with a conference-best 67 goals (3.67 per game) and 4.47 points-per-game average. Four of her scores were game-winners, second-best in the league. She makes her first appearance on the first team after earning second-team recognition in 2009. SETTING THE SCENE: Cleveland State remains at home this week to host the 2010 Horizon League Softball Championship at Viking Field. The six-team tourney, a change from previous years when all nine teams qualified, will be played from tomorrow-Saturday, May 13-15. Action starts each day at 10:00 a.m. with four games scheduled for both Thursday and Friday and the final two or three games on Saturday. The Vikings (42-13, 22-2), who won the regular season title with a league-record 22 wins, enter the tourney as the No. 1 seed and will play the winner of the No. 4 Valparaiso vs. No 5 Green Bay game on Thursday at 2:30 p.m. Cleveland State is 14-1 in league games at home this year, carrying a 14-game win streak into the opener on Thursday. The Vikings won the tourney title in 2009, defeating top seeded UIC in the title game.